If you're moving during the summer, book as soon as you can. Ideally, two months before your move date. Worse case, at least 4 weeks, but know that if you only have a month or less before your move, you'll have a limited choice of movers. Most good movers are booked 2-3 months out. While there is no "average tip", it is widely accepted that tipping amounts for movers range from 5% of the total bill to $20 per man. Proper etiquette is to tip each mover individually, not to the leader or supervisor. How long it takes to load a truck depends on certain factors. 1st floor, 2nd floor, 3rd floor...stairs and depending on how far the truck parked however If the truck is less than 50 feet away from your ground or first-floor apartment, 2 professional movers can load a 10' truck in less than an hour. Loading a 24' truck takes 4 hours, and a 26' truck 4.5 hours. How much does it cost to move withing Boston? 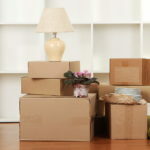 Cost can be vary according to many factors, stairs, distance between the truck parked, busy season like summer time ect...These tips will help to figure out to talk how to approach a moving company around in Boston.